As the calender changes from summer to fall, bringing with it cooler temperatures, earlier sunsets, and discussions about the ridiculously early Christmas decorations that already fill the stores, I feel like most people inevitably say goodbye to the light fare of summer and welcome in a season of heavier, richer foods. But, it doesn't have to be that way. Take this salad, for example. 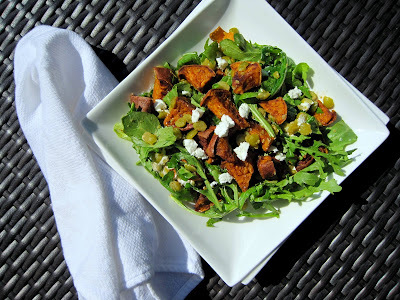 Blending the fall-friendly flavor of roasted sweet potatoes with nutritious lentils, guilt-free arugula, and just a smidgen of creamy goat cheese - its the ideal way to hold on to the refreshing meals of summertime while still embracing one of Autumn's most beloved harvests. This recipe was made in honor of ONE's ongoing sweet potato campaign. Please be sure to check out their tumblr for a delightful collection of yummy recipes. Preheat the oven to 400°F. Toss the sweet potatoes with 2 tablespoons oil, cumin, paprika, and salt. Arrange in a single layer on a lined baking sheet and roast for 20 minutes. Flip the pieces and roast for an additional 10-15 minutes or until tender. Cool and set aside. Meanwhile, soak the lentils for 10 minutes in a small bowl, then drain. In a large pot, cook the lentils in boiling salted water until tender but firm, about 30 minutes. Rinse with cold water than drain and cool. Combine the lentils, sweet potatoes, any accumulated oil from pan, arugula, half of the goat cheese, vinegar, and 1 tablespoon oil. Season with salt and pepper and additional vinegar if desired. Divide among plates and sprinkle with remaining goat cheese.